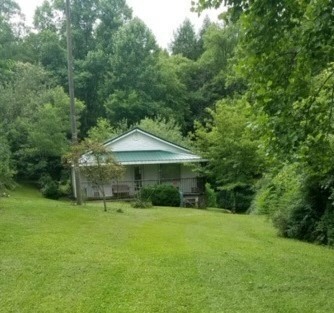 ABSOLUTE AUCTION-ESTATE OF IRA MULLINS | GAINES DICKENSON AUCTIONEERS, INC. ABSOLUTE AUCTION-ESTATE OF IRA MULLINS – GAINES DICKENSON AUCTIONEERS, INC.
PROPERTY BEING SOLD TO SETTLE THE ESTATE OF IRA MULLINS A WELL KNOWN BUSINESS-MAN IN DICKENSON COUNTY AND THE CLINTWOOD AREA. FORMER OWNER OF THE FLEMINGTOWN MARKET AND LONG TIME RESIDENT OF THE FLEMINGTOWN SECTION OF CLINTWOOD. SHORT DISTANCE FROM ELEMENTARY SCHOOL AND HOSPITAL. 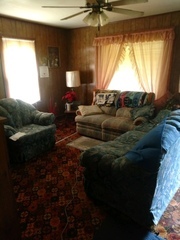 RESIDENCE AND FURNISHINGS SELL @ ABSOLUTE AUCTION TO THE HIGHEST BIDDER IN AS IS CONDITION. NICE LEVEL SECTION IDEALLY ADJOINS THE CREEK PROVIDING AN AREA FOR GAZEBO & LAZY SUMMER EVENINGS BY YOUR FIRE PIT. PROPERTY SELLS BY THE BOUNDARY AS PER DEED DESCRIPTION. EASY ACCESS TO THIS 2 BR, 2 BTH, LIVING ROOM, EAT-IN KITCHEN, with vinyl siding, new metal roof, replacement windows, public water, front sitting porch, 1/2 basement, private septic with new distribution box, hardwood under carpet in every room except kitchen, minutes from elementary school and hospital. Lone frontage along Fleming Creek all situated on 1 +/- acre lot described in two tracts. Tax card 1175(187C-714) AND 1174 (187C-715), DB 144/PG 503. FURNISHINGS/PERSONAL PROPERTY SELLING AS IS TO THE HIGHEST BIDDER AT ABSOLUTE AUCTION. 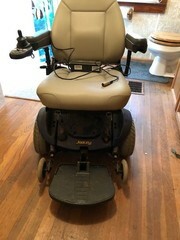 JAZZY POWER MOTORIZED CHAIR (NEEDS NEW BATTERY); 3 STONE CROCK CHURNS W/HANDLE AND LIDS; LARGE QUANTITY BALL AND MASON JARS QUART AND PINT; COUCH; LOVESEAT; CHAIRS; METAL STORAGE SHELVING RACKS; TABLES; LAMPS; OWL COIN BANKS; KITCHEN COUNTER TOP APPLIANCES; TV CABINET; MICROWAVE; KITCHEN UTENSILS; DEHYDRATOR; HUMIDIFIER; FULL BED; HALD BED; BOXES GLASSWARE; FILE CABINET; DRESSER; CHEST; OIL LAMP BASE; DVD’S ; CASSETTES; 8 TRACTS; CERAMICS; FIGURINES; FAUX FLOWERS. PAYMENT IN FULL BY CONCLUSION OF AUCTION BY CASH OR GOOD CHECK. TEN PERCENT (10%) BUYER’S PREMIUM WILL BE ADDED TO EACH LOT OR ITEM TO CONSTITUTE THE FINAL BID. MANY ADDITIONAL USEFUL ITEMS. COME INSPECT FOR YOURSELF. 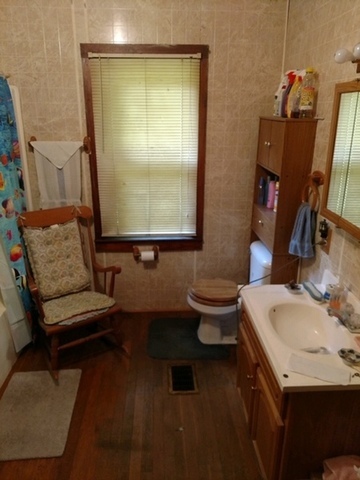 CALL OR TEXT SELLING AGENTS FOR PRIVATE SHOWING OF THE REAL ESTATE AT YOUR CONVENIENCE. FURNISHINGS AVAILABLE FOR INSPECTION ONE HOUR PRIOR TO AUCTION. BIDDER REGISTRATION REQUIRED BY PRESENTING A PHOTO ID SUCH AS DRIVER’S LICENSE. SUCCESSFUL BIDDER WILL BE REQUIRED TO SIGN A LEAD BASED PAINT DISCLOSURE FOR HOUSES BUILT PRIOR TO 1978. THE PURCHASER WILL WAIVE ANY ASSESSMENT FOR THE PRESENCE OF LEAD BASED PAINT AS REQUIRED BY TITLE X. A COPY OF THE DOCUMENT IS AVAILABLE UNDER DOCUMENTS ON THIS LISTING. REAL ESTATE-SELLS ABSOLUTE IN AS IS CONDITION. FIVE PERCENT BUYER’S PREMIUM WILL BE ADDED TO THE HIGHEST BID TO CONSTITUTE THE FINAL CONTRACT SELLING PRICE. 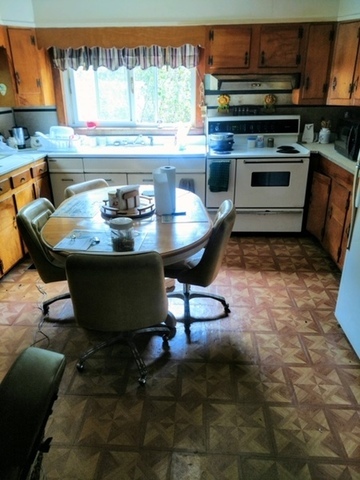 A NON-REFUNDABLE 10% ESCROW DEPOSIT IS REQUIRED BY THE CONCLUSION OF THE AUCTION. SAID DEPOSIT WILL BE PLACED IN OUR ESCROW ACCOUNT AND HELD UNTIL CLOSING WITHIN THIRTY DAYS OR AS SOON AS LEGAL DOCUMENTS CAN BE PREPARED BY THE LENDING INSTITUTION IF APPLICABLE. ANNOUNCEMENTS MADE AUCTION DAY TAKE PRECEDENCE OVER ALL PRINTED OR VERBAL STATEMENTS. INSPECTION AT YOUR OWN RISK, NEITHER THE AUCTION FIRMS, AUCTIONEER, NOR THE SELLER ARE RESPONSIBLE FOR BODILY HARM OR DAMAGES TO PERSONAL PROPERTY WHILE ON THE AUCTION SITE. BIDDER/PURCHASER IS RESPONSIBLE FOR OWN DUE DILIGENCE AND BIDS BASED UPON OWN JUDGMENT. PURCHASE IS NOT SUBJECT TO SECURING OWNER FINANCING AS POTENTIAL BIDDER SHOULD HAVE PRE-QUALIFIED WITH LENDING INSTITUTION. APPOINTMENTS CAN BE MADE TO INSPECT THE REAL ESTATE BY CONTACTING SELLING AGENTS BY PHONE OR TEXT. FURNISHINGS SELL AT ABSOLUTE AUCTION IN AS IS CONDITION. A TEN PERCENT BUYER’ S PREMIUM WILL BE ADDED TO THE HIGHEST BID ON EACH LOT OR ITEM TO CONSTITUTE THE FINAL SELLING PRICE OF THAT ITEM OR LOT. PAYMENT IN FULL AUCTION DAY BY CASH OR GOOD CHECK. NO DEBIT OR CREDIT CARDS ACCEPTED. IMMEDIATE REMOVAL REQUESTED. NO ASSISTANCE IN REMOVAL OF ITEMS PURCHASED. VIRGINAL SALES & USE TAX APPLIES UNLESS DEALER TAX EXEMPT NUMBER AND FORM FURNISHED TO AUCTION FIRM DAY OF AUCTION. NO EXCEPTIONS. IN THE TOWN OF CLINTWOOD AT THE MULTIPLE TRAFFIC LIGHTS FOLLOW E MAIN STREET PAST CLINTWOOD COURTHOUSE FOR A TOTAL OF 2 MILES. CLINTWOOD MAIN BECOMES THE LAKE ROAD, AT THE END OF 2 MILES, TAKE FLEMINGTOWN DRIVE (AT DOWN HOME MARKET) AUCTION SITE IMMEDIATELY ON THE RIGHT. AUCTION INFORMATION ON SITE.